The US has lately begun drawing India into the forecourt of its unilateralism vis-à-vis Russia and Iran, and Delhi may have to pay a heavy price for Washington’s selfish ambitions. Any premise that India’s engagement with the emergent world order can be transactional may appear smart thinking. But it is inherently flawed. Selective engagement with a globalised world is impossible for a country that is itself avidly globalising. Besides, as an emerging power, India’s long-term interests lie in positioning itself to influence the formation of the new world order. Above all, the birth of the new world order also coincides with a historic shift in the locus of power from the West to the East. New value chains are being formed and India must remain open to them. China’s Belt and Road Initiative is already a compelling reality. Telcogeopolitics—West versus China in the 5G race for control over the technology’s global standards—is posing Delhi a dilemma. Cherry-picking is not an option. In the period ahead, India’s strategic ambivalence will become increasingly untenable. 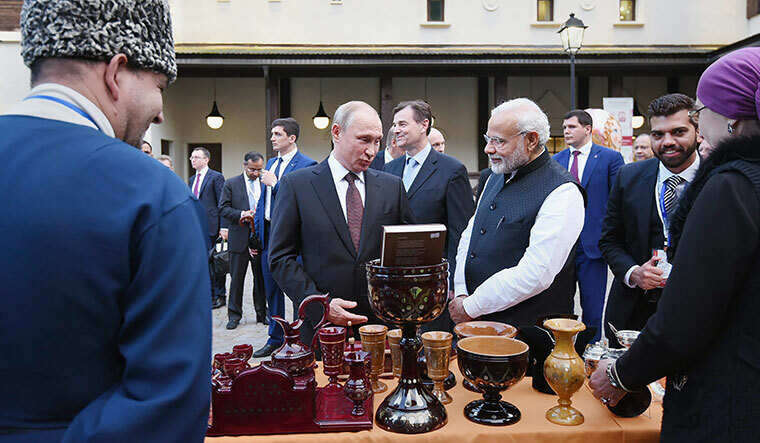 Instead of looking for tiny windows of opportunities now and then in the big power relationships, India should wade into the stream and define its political power in terms of the geographic space of the Eurasian region. The bottom line is that India is either at the Eurasian table or on the Eurasian menu. That is why the India-Russia summit is invested with extraordinary significance. The two countries have to reset their relations to cope with a highly complex and contradictory historical stage in world politics. The US National Security Strategy unveiled last December openly identified Russia and China as “revisionist” powers who pose threat to American dominance and whom, therefore, Washington intends to counter. At the very core of this struggle lies the clash of two opposing trends in the international system. On the one side, multipolarity is gathering momentum. Nations are asserting their sovereignty and their prerogative to choose their own paths of development in tune with their cultural and historical identity and heritage and their circumstances. New growth centres have appeared that are not dependent on the West for keeping up the tempo of their development. Quite obviously, it is no longer possible for any single power to dominate the world order. On the other hand, the entrenched western powers, led by the US, are loathe to giving up their status as “world leaders”, although it is abundantly clear that the notion that history had ended following the collapse of the USSR has proved wrong. They are hell bent on rolling back or at least slowing down the trend of multipolarity. Thus, the UN is being bypassed, international agreements are summarily rejected and self-serving unilateral approaches are being prioritised. The US has lately begun drawing India into the forecourt of its unilateralism vis-à-vis Russia and Iran, and Delhi may have to pay a heavy price for Washington’s selfish ambitions. What is at work here is nothing less than political blackmail and economic pressure. The US enacts laws to punish Russia and Iran for political reasons and expects India to abide by such legislation. Thus, the US has withdrawn from the 2015 Iran nuclear deal, despite the fact that the agreement carries the imprimatur of the UN Security Council or that the International Atomic Energy certifies on a regular basis Tehran’s compliance with the obligations under the pact. In regard of both cases—Russia and Iran—Washington is also pursuing business interests. The US arms vendors hope to replace Russian partners in the Indian market and Big Oil covets India as a huge guzzler of energy. The Narendra Modi government is in the defensive mode by seeking exemption from the US laws on a case-by-case basis. But, in the process, Delhi is conceding to Washington the prerogative to have a say in India’s relations with two friendly countries. Delhi has never conceded ground to any power in this fashion, and seeking exemption from US laws is tantamount to infringement on India’s sovereignty. This can only end like the proverbial camel entering the tent, given the American style of diplomacy to keep up pressure tactic and demand “some more”. A senior American diplomat Alice Wells was quoted as saying last week that with a tougher round of US sanctions on Iran clicking in from November 4, Washington “recognises” India’s need for significant oil imports and is having conversations with Delhi to ensure there are alternative supplies of fuel “so that our friend India’s economy is not adversely affected”. How nice! But the issue here is not that Indians do not know how to buy oil in the world market. The issue is about the terms at which oil is purchased. Can Wells ensure that Washington arranges oil for India on commercial terms similar to what Tehran is offering? The Iranian oil comes at discounted price and on deferred payment basis and keeps India’s oil import bill from spiralling up. On the contrary, Washington’s long-term objective is to persuade India to import oil and LNG from the US at prices that are substantially higher than from Iran. Similarly, the manner in which US-China tensions are playing out also holds profound meaning for India, although the tendency among Indian analysts is to view China’s travails with a sense of schadenfreude or in a spirit of rivalry as to how India could exploit China’s tribulations. Jaitley’s remarks pinning hopes on an impending US-China trade war blithely overlook that the trade war is only a manifestation of an epochal struggle in the making of the new world order. Yet, the trade war with the US as such cannot have serious deleterious effects on China’s economy or other areas. Foreign trade accounts for just about one-tenth of China’s total economic volume of 82 trillion RMB. And out of the 8 trillion RMB foreign trade, Sino-US trade accounts for just about one-tenth. Any impact of a brutal US-China trade war for China’s overall national growth rate may range somewhere from 0.2 per cent to 0.5 per cent only. Surely, the Chinese are capable of managing this zheteng, as they call it, (which means “much ado about nothing”)? 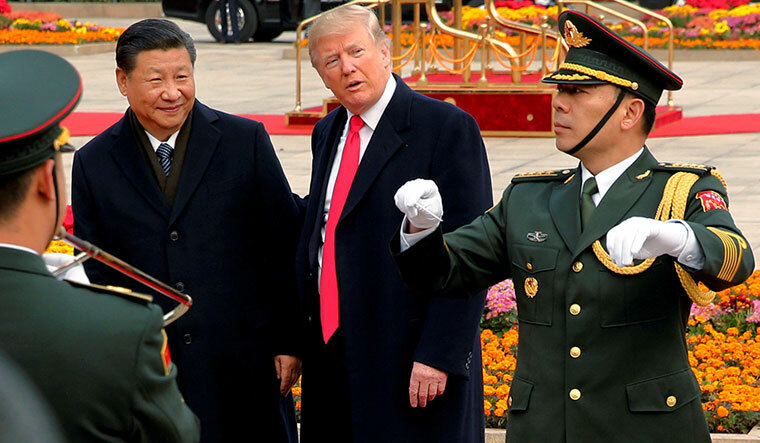 A fascinating study published recently in The Washington Quarterly titled “Beijing’s Bismarckian Ghosts: How Great Powers Compete Economically” made three key conclusions. One, we are barking up the wrong tree by viewing the US-China rivalry through the prism of the ‘Thucydides Trap’ (briefly, how a rising power causes fear in an established power, which inevitably escalates towards war). The study says what we need to expect instead is great power economic competition amidst the emergence of economic globalisation and “explosive technological innovation”. Two, the dynamic of the emerging US-China competition bears uncanny resemblance to another great rivalry in modern history—between Great Britain and Germany in the second half of the 19th century. China has long admired Germany’s export-led growth model and has been sceptical of laissez faire capitalism, so much so that the 19th century Qing general Li Hongzhang apparently kept a photograph of Otto von Bismarck in his study and admired Alfred Krupp as a model for how to industrialise China. Three, most important, to quote the Princeton professors, “Indeed, economic competition among great powers is often about tools far more subtle and sophisticated than tariffs…. Beyond blunt tariffs, at least four economic tools— standard-setting, technology acquisition, financial power, and infrastructure investment—were and are the battlegrounds for great power economic advantage.” The professors pointed out that Great Britain’s decline in the face of the German ascendancy by the beginning of the 20th century offers a “cautionary tale”. Put differently, a US strategy of “unbridled, unnuanced confrontation is unlikely to be successful” with China and “Washington needs to renegotiate elements of its economic relationship with Beijing”. The US-China economic competition is in many ways a preview of what will happen to India also as it climbs up the greasy pole in the world economy. In fact, President Trump has repeatedly called attention to India’s growth as a potential competitor for the US. Clearly, what is unfolding is a struggle for power by the US. Although the world’s strongest power, the US is a declining power (like Britain in the late 19th century) and its influence is going down, especially on the economic front. India should have great clarity where its medium and long-term interests lie in this geopolitical situation. In sum, India’s approach to the emerging multipolar world should be progressive, constructive and unequivocal. The visit by Russian President Vladimir Putin to Delhi this week is a great opportunity for India to shed its strategic ambivalence. Bhadrakumar is a former diplomat.